Street Photography provides expert advice on the best types of cameras and lenses for street photos, with handy shooting tips on all aspects of the genre and website links to the world’s best Street Photography. The book includes easy to follow techniques, from zone focusing, framing, single-frame/burst capture, positioning, timing, and 4K movie options, through to the aesthetics and practicalities of colour versus B&W, and how to develop your own Street Photography style. 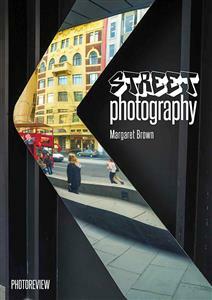 Street Photography author is Photo Review Australia's expert, trusted technical editor Margaret Brown. All content in Street Photography is protected under copyright and cannot be reproduced in any form without written consent from the publisher. Published July 2017. All rights reserved. The Photo Review Pocket Guides series includes Photo Backup, Photo Editing, Travel Photography, Low Light Photography, Action Photography, Lenses Guide, Printing Digital Photos, Digital SLR, and Compact System Camera Guide. Street photography has been practised almost since photography was invented, although it only became recognised as an artistic genre between the 1920s, when the 35mm rangefinder camera was invented, and came of age in the 1960s. During this period, John Szarkowski at the Museum of Modern Art in New York raised the snapshot to a higher aesthetic level, making it a prominent motif in American photography. Photographers like Henri Cartier-Bresson, Robert Frank, Bill Brandt, Diane Arbus, Walker Evans, and Dorothea Lange became household names, largely because their photographs appeared in popular magazines like Life. Street photographers can choose to take candid shots of subjects who are unaware of being photographed. Street photography survives as a genre, despite the proliferation of camera-phones. Although anyone with a smart-phone can take candid pictures in public places, most of these photographs are little more than snapshots and easily forgotten. True street photography requires a lot more than point-and-press picture-taking. From the first, there has been on-going controversy about what constitutes street photography. Must it always record human subjects? Must the subjects be unaware of being photographed – or can they be posed? And, if aware of being photographed, to what extent can they participate in the act of creating the picture? Subjects may be well aware of the camera. There may be no people in the shot; just evidence of their presence. Some street photographers insist street photographs have to be candid and shot without permission from the subject. Others say the images must record a decisive or inspiring moment and yet others imply photographers should aim to document people and their behavior in public places (although this practice has its own genre: documentary photography). The overlap between street and documentary photography can be difficult to define. In general, however, documentary photography conveys a deliberate message, whereas street photographers simply reflect the society of the time. Wikipedia defines street photography as photography that features the chance encounters and random accidents within public places. Human subjects are not mentioned specifically. The definition continues: Though people usually feature directly, street photography might be absent of people and can be of an object or environment where the image projects a decidedly human character in facsimile or aesthetic. Whichever definition you choose, your photographs must be taken in public places; not in private venues. You don’t need to travel to ‘faraway places with strange-sounding names’; often the best places for street photography are close to home. The issue of street photographers taking photographs of strangers in public places without their consent has always been controversial. But in recent years photographers have found it increasingly difficult to practice street photography because of a climate of exaggerated fears about invasion of privacy and increasing regulation of public space. Both run contrary to the perceived ‘openness’ of the Australian culture and neither is fully justified. The proliferation of social media complicates the situation. During the 20th century, the only place someone could have their photo published without their consent, where it was likely to be seen by many people was the newspaper. Today, sites like Facebook and Instagram make once-private snapshots available to millions of people around the world. And, whereas newspapers are only retained for a day or two, images posted online may be accessible almost indefinitely. Modern photographers are faced with a complex dilemma: how to balance the cultural importance and historical benefits of recording life in our towns and cities against negative perceptions that might result when people are photographed without consent. It’s difficult to define the extent to which being photographed in public might actually be harmful, although there are important exceptions explained later in this chapter. Street photographers can document most aspects of contemporary life in cities and towns in many parts of the world, thereby providing a valuable record of fashions and social mores. People photographed in the street are effectively anonymous until they create a fuss – at which point they become the focus of many eyes. There are also people who will claim an ‘invasion of privacy’ simply to draw attention to themselves. Do these people who object to being photographed also feel insulted by being looked at? How much of the frame must their face occupy to justify a complaint? And how should we deal with anyone who happens to be in the background of shots? Making it illegal to take photographs of people in public places (as happens in Hungary) creates a society where people are afraid to use a camera in public. It’s likely to result in tourists and other innocent people being apprehended. Many forms of journalism and travel writing/photography would also be threatened. And that, most people would agree, is undesirable. With so many people taking ‘selfies’ and posting them on social media, it becomes difficult to draw a line between what is and isn’t an acceptable subject for street photographers. In fact, the borderlines between what is acceptable and unacceptable are relatively well-drawn in Australia – and they relate to how the photographs are used. There’s no absolute right to privacy when you are in a public place. But everyone has a right not to be commercially exploited. Street photographers are generally constrained by the intended end use for their pictures. The law tends to split photographers into two categories: 1. Hobbyists and 2. Other film-makers and Photographers, including students. Hobbyists are normally able to take pictures in most public places, although they may require permission to photograph in some situations (such as railway stations). Other film-makers and photographers are seen as ‘commercial’ photographers who take photographs to sell. Permission to take photographs is generally required. If this photo is purely for the photographer’s private use, no permission is required. However, if the photographer will sell usage rights to a stock library or advertising agency, post it on a commercial website or submit it to a competition, the subject’s permission should be sought. According to Andrew Nemeth BSc (Hons) LLB MTeach, the commercial use of a photograph is not restricted to the sale a picture, but applies primarily to the use of a person’s likeness to endorse some product or service, or to entice others to buy it. The following are examples of commercial and non-commercial situations.